MySpace Says It Lost Years Of User-Uploaded Music Millions of music and other media files may have been lost, the company acknowledges. The news comes after some users reported difficulty accessing their music files over the past year. 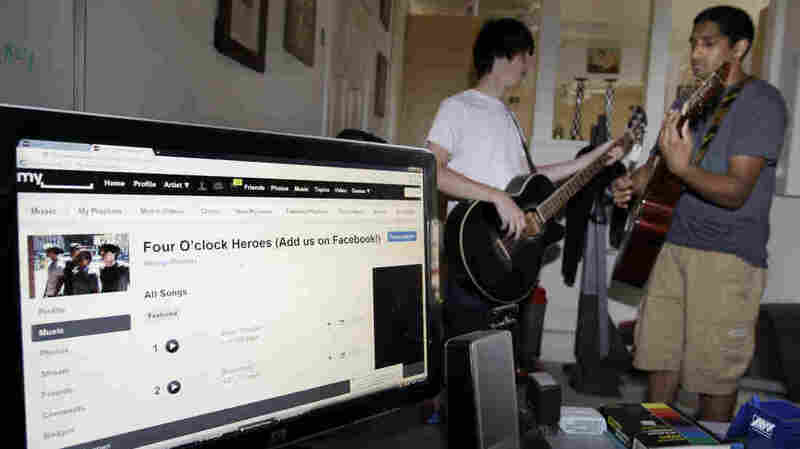 Members of the rock group Four O'clock Heroes, performing in 2011, used MySpace to promote their work. The social network may have lost millions of media files uploaded by users. MySpace — the once-dominant social media platform that was largely subsumed by Facebook — may have lost a decade's worth of music uploaded by users, the company says. MySpace started in 2003 and quickly gained traction as a platform for uploading and sharing music, particularly for new bands trying to find an audience. Now the company says millions of music files uploaded to the site may have disappeared. NPR has reached out for comment from MySpace. According to several media reports, it posted a message on its site recently reading, "As a result of a server migration project, any photos, videos, and audio files you uploaded more than three years ago may no longer be available on or from MySpace. We apologize for the inconvenience." "More than 50 million tracks from 14 million artists has been lost," reports The Guardian. Users of the social network have reported problems accessing their music over the past year. On "techsupport," a Reddit forum, one user wrote a year ago, "duuuude i need my songs I hope they fix this soon." 'There is an issue with all songs/videos uploaded over 3 years ago. We are aware of the issue and I have been informed the issue will be fixed, however, there is no exact time frame for when this will be completed. Until this is resolved the option to download is not available. I apologize for the inconvenience this may be causing.'" Andy Baio, one of the people behind Kickstarter, tweeted, "Myspace accidentally lost all the music uploaded from its first 12 years in a server migration, losing over 50 million songs from 14 million artists. I'm deeply skeptical this was an accident. Flagrant incompetence may be bad PR, but it still sounds better than 'we can't be bothered with the effort and cost of migrating and hosting 50 million old MP3s.'" The site was purchased by News Corp. in 2005 for $580 million. News Corp. considered acquiring Yahoo and merging it with MySpace but eventually dropped those plans. Instead, it sold MySpace for $35 million in 2011. The site has waned in popularity since its creation, but some members have continued to use it as a place to store music, photos and other media files.